With almost three decades in the game, Nas and the city of New York are synonymous with one another. In fact, the hip-hop titan's new album, NASIR, saw him take the Kanye West-produced set to Queensbridge Park for a listening party, continuing his legacy with the city that he's repped since birth. After all, the title for King of New York was never so prominent until Nas took the throne with the release of his debut album, Illmatic. In honor of his ties, iHeartRadio LIVE and Verizon have curated an epic series of intimate concerts just for New Yorkers and the rapper's set is first up. You heard it first. We're giving you the opportunity to get up close and personal with your favorite artists, courtesy of iHeartRadio and Verizon. Beyond being born in Brooklyn in 1973, Nasir Bin Olu Dara Jones' career in hip-hop is cemented in the city. After recording a demo at Sty In The Sky Studios in Coney Island, he took daily trips to Manhattan in hopes of securing a deal, and one day it led to an opportunity of a lifetime: a record deal with Columbia, a $17,000 advance and his debut, Illmatic. Told through the eyes of a budding '90s rapper in New York City, it changed everything. New York hip-hop went on to see shining moments when he repped the streets in his video for "If I Ruled The World (Imagine That)"and even tried his hand at acting in 1998's Belly, a crime drama about two Queens' street criminals. After winning the title of King of New York against JAY-Z in 2001 with his ferocious diss record, "Ether," Nas affiliation with the city was never again doubted. Throw in his love for the Mets and his New York restaurant Sweet Chick, and it's very clear why iHeartRadio LIVE and Verizon have selected him to jumpstart our upcoming concert series. If you want to get into the mix, stay tuned for details on how you can participate in our upcoming scavenger hunt, detailing the secret location of where his show will take place. 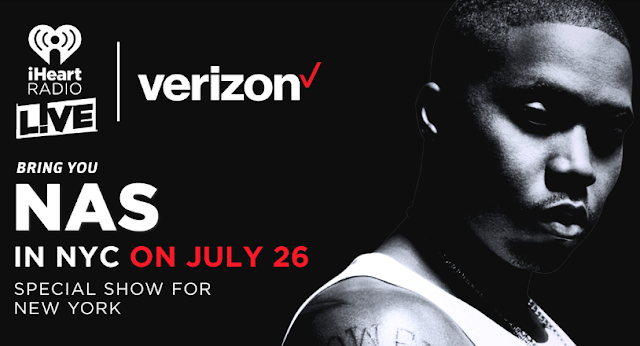 All you have to do is keep your eyes peeled to @Z100NewYork, @Power1051 and @1035KTU for the big reveal and your chance to win tickets to see yet another historic milestone between Nas and New York City.